With Tuesday, November 6 being election day (remember to get out and vote! ), we thought that this would be a great time to focus our exhibit on U.S. presidential campaigns. Exhibits often need a visually appealing item to help bring people in the door. 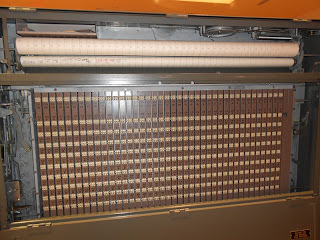 For our current exhibit, we found what we thought would be just the thing, an old-fashioned mechanical voting machine. First introduced in the 1890s and still being used in a few places as late as the 1990s, these metal monsters were an amalgam of gears and counters that weighs around 500 pounds. 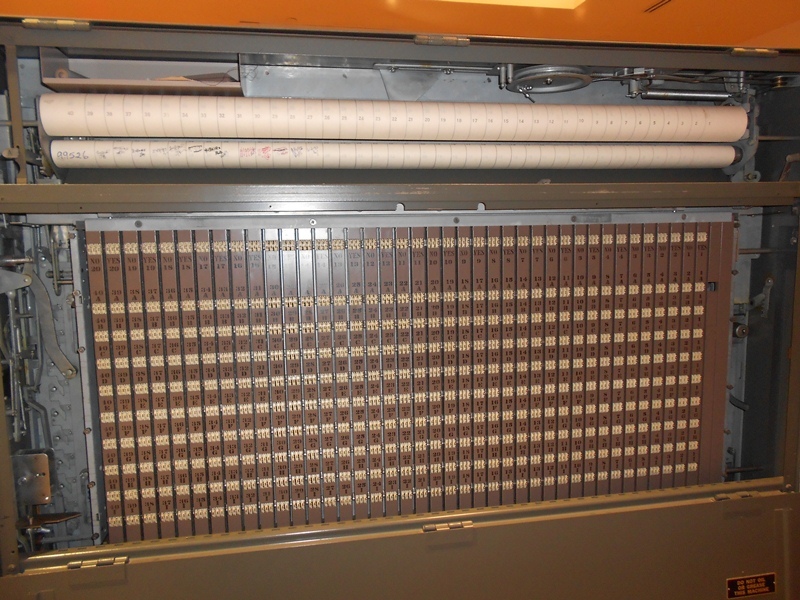 For the better part of a century, mechanical devices like this one were how many Americans registered their vote. 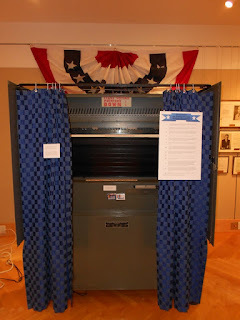 The Michigan Historical Center, which included one of these machines among its collection of artifacts, was happy to loan it to us for display, provided we came down to Lansing and picked it up. Given the size of this machine, this wasn’t going to be a typical field trip. In mid-September, Janet Danek, the Libraries’ coordinator of exhibits, and I got into a rented truck and started south. With the help of several staff from the Center we managed to roll the machine, which was mounted on four large metal casters, out of the large state warehouse where it is stored into the truck and tied it down with rope. As we drove away from the loading dock, things were looking good, until the first stop sign. A bumping, grinding sound made it clear the machine had begun to roll around. The noise got worse with every start and stop. A few blocks later we pulled over to see what was happening and discovered the ropes we had brought simply weren’t holding the machine in place. A few more miles and the machine was either going to roll into the cab of the truck or through the truck’s back door. Either way, we guessed the folks back at the Historical Center wouldn’t be too happy with us. As I struggled with the ropes in a vain effort to make them work Janet, a wiser person than I, walked into a local business – a recycling center. Having been to more than one such facility in my day, we used to call them by the somewhat less elegant name of “scrap yard,” I was doubtful that she was likely to find anyone much interested in our problem. I couldn’t have been more wrong. Friedland Industries has been in Lansing for more than a century. Founded by a Latvian immigrant, the public-spirited firm has a long history of recycling, civic involvement, and a deep love of history. Mike Bass, great-grandson of the founder, came out and looked over our situation. We needed tie downs, and after telling Janet where to buy them he decided maybe he should go over and help her pick them out. When Mike and Janet came back, Mike sized up the situation pretty quickly and said, “Hey, let me help you get those on right!” Half an hour later, after having come inside to look at wonderful historic photos of the company that Mike had, we were on our way. And Mike was our new BFF! If you have some time, drop by the Clarke exhibits galleries to see the engine of democracy that nearly decimated a rental truck on the short trip between Lansing and Mount Pleasant (no need to mention that decimating thing to the Mt. Pleasant Rental Center – this is all between friends, right? ), as well as viewing a promotional film made during the 1950s by the machine’s manufacturer. And if you happen to have some scrap you need to dispose of, you might consider Friedland Industries at 405 E. Maple St. in Lansing (telephone 517.482.3000 or visit their website, http://friedlandindustries.com/). Ask for Mike and tell him Frank and Janet sent you! We’re in his debt for a big favor!